Patrick Stewart's been busy. Starring in movies like X-Men? Check. Broadway? Sure, why not. Palling around the planet with perennial BFF Ian McKellen? Absolutely. But once upon a time he was Star Trek: The Next Generation's Captain Jean-Luc Picard, a role that's become all the more relevant with lines beginning to blur between science fiction and science fact. Smithsonian.com caught up with the nigh-legendary actor to discuss a rapidly unfolding real-world future that's been fairly profoundly influenced by Star Trek, one of the most-watched and beloved science fiction series of all time. Change is afoot, with things like human-like AI and transhumanism—once the domain of far-flung tales of jargon-ridden derring-do—becoming almost inevitable. Star Trek has always been fairly unique among mainstream works of sci-fi in that it's an almost utopian view of what would happen if humanity decided to fly right past the moon and play among the stars. There are conflicts, sure, but resolutions tend to come in the form of diplomacy and learning. Meanwhile, our world is moving in both miraculous and frighteningly dystopic directions (bye bye, privacy), a fact that's not lost on Stewart. “These days, I find myself continually torn between a sense of almost juvenile hopefulness and a real despair," he began. "We addressed that issue very powerfully in an episode ['The Measure of a Man']. A Starfleet Judge Advocate General presides over a hearing to determine whether Data is a sentient being or property. And I remember at one script conference, Whoopi Goldberg, during the period when she was with us on the show, saying what we ought to make clear in this­—that we’re actually talking about slavery. And it was a great point to make. If we create independent life but keep it under our control, what is that? It can be said to be a form of slavery." "I hope that the moral questions will be addressed as enthusiastically as technical questions will be addressed when it comes to artificial intelligence. We’re on the very perimeter of it all the time. I’m a chancellor at a university in England and we have a department which is working on very, very specialized kind of engineering. They are now putting sensors into the very heart of machinery that will tell you when there is a possibility that that machinery might go wrong." He then branched off into a discussion of technology's newfound stranglehold on communication—and, naturally, his concerns. "I’m fascinated by this technology. I’m happy to say that my university is in the forefront of this kind of research. And I’m excited by that but…in the same way that we’ve had to start asking questions about personal liberty, and what is the nature of privacy as social networking and aspects of reality television and exposures become more and more successful and money-making, we have now to look at what is the nature of privacy and what can one expect as a right." It is, then, as everyone on Earth's own spacedad said, both a thrilling and terrifying time to be alive. For his part, Stewart hopes that his work—whether on human rights projects like the London-based Refuge program for abused men and women or his choice of roles like Captain Picard and Charles Xavier—can help make some small, shining sliver of a difference. "I’ve had many lovely things said to me over the years, but only very recently, I just stopped to have a chat with these [policemen] and then I went on. And one of them followed me and said, 'Can I have a word just alone?' He was a young policeman, red-haired guy. And he said, 'I always wanted to be a cop,' he said, 'Always, but it was watching Star Trek that I knew what kind of cop I wanted to be. Thank you. It was because of you and Star Trek.' So when things like that happen, it makes you feel immensely proud of what we did." Oh, and in case you were wondering, he also explained who would win in a fight between Captain Picard and Captain Kirk. 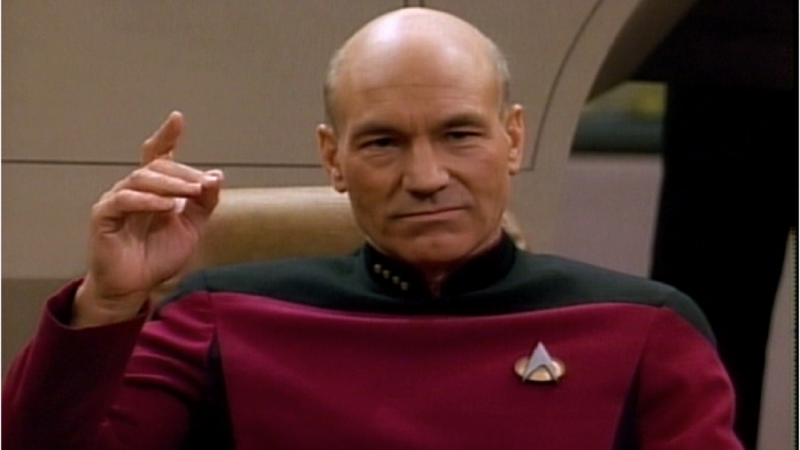 "My answer always was there wouldn’t be a fight because Picard would negotiate his way around it. Picard saw force as a last resort. Absolute last resort." Is anyone missing a mic? I just found this one. I think it might have been dropped.